Hundreds of students watch as Mercer University engineering students prepare to let go of a hydrogen- filled balloon at PCHS last week. The sky is no longer the limit for opportunities to learn in Putnam County Charter School System. 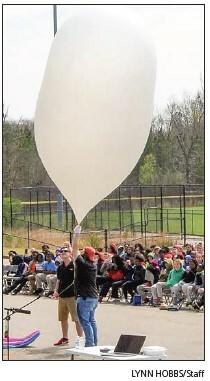 NASA officials recently spent an entire day at Putnam County High School March 23, teaching and interacting with students and watching as a weather balloon was launched from near the school’s ball fields. 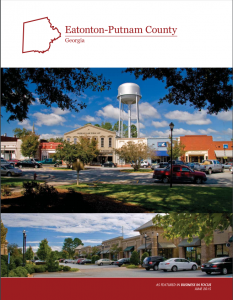 Leaders from Putnam and Baldwin counties also attended the event, as did students from Putnam County Middle and Elementary schools, Baldwin County schools and Georgia College’s Early College. NASA Launch Manager Tim Dunn and NASA Chief of Fleet Systems for Launch Service Mic Woltman made their presentation in the school’s Black Box Theater, frequently relating what they do at NASA with what the students have learned, in school. 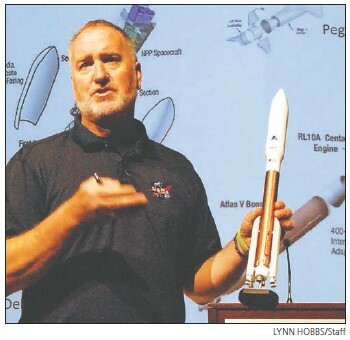 NASA Chief of Fleet Systems for Launch Service Mic Woltman shows a model of the Atlas V, as he explains the launch system. “Thirty to 35 years ago, we were right where you are right now,” Dunn told the students. “Our team at NASA is made up of 450 people – it takes all kinds of folk to be part of the NASA family, so whatever you are interested in and learning at school could get you a job at NASA one day,” Woltman added, going on to describe the NASA chef who cooks meals for the astronauts and using that as an example of the broad range of skills needed at NASA. 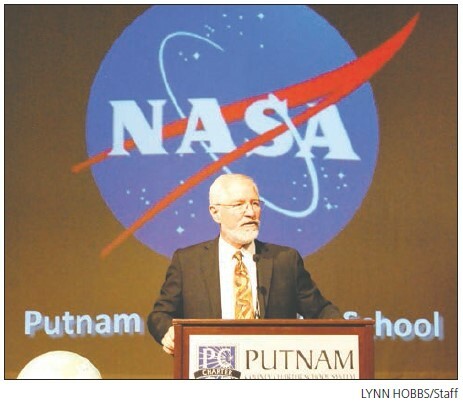 The NASA logo can be seen on the big screen behind Putnam County High School Principal Marc Dastous as he gives instructions to the crowd regarding where to get their lunch and see the balloon launch. In great detail, the two described the process of launching rockets, satellites and other vehicles into space. They asked questions all along the way, and encouraged the students to ask questions to them, offering a NASA patch or pin to each one who did. There was no designated Q&A time, so the two men answered questions throughout their presentation, which covered everything from Sir Isaac Newton to what kind of gas mileage a rocket gets. After the NASA presentation, everyone went outside to the drone port, where nine students of Mercer University’s School of Engineering launched the balloon. Each step of the process was explained. Mercer Associate Professor Dr. Anthony Choi said the experience was a practice for when his students go to North Carolina to launch a balloon that will film the solar eclipse on August 21. “Only two to three times every 50 years can a solar eclipse be seen from the soil of the U.S. and it’s never been documented and filmed from space in a systematic way,” Choi said. 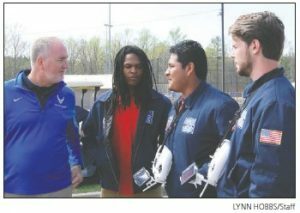 PCHS students talk with NASA Chief of Fleet Systems for Launch Service Mic Woltman during the balloon launch program. The Mercer students frequently launch balloons for NASA from the University’s property, but this was the first time they have launched one from a remote site. March 23 was a windy day, and the Mercer students battled to keep the balloon in their hands as they filled it with 300 cubic feet of hydrogen. Choi said hydrogen is much cheaper than helium. “It typically costs around $10,000 per pound to launch a rocket, but we can launch a balloon for about $8,” he said, noting the balloons go up 120,000 feet in the sky.